Husson University offers three choices of concentrations for those wishing to pursue a career in secondary education: English, Physical Science, and Life Science. Graduates earning the BS in one of our programs may choose to teach in middle and high school settings, in either the public or private sector. Along with diverse coursework, these programs integrate substantial experiential learning through clinical, practicum, and student teaching placements in a variety of classrooms. The Husson University School of Education realizes that the teaching profession needs leaders who are committed to influencing the future one student at a time. The Secondary English Teacher Education concentration prepares graduates for grades 7-12 language arts teaching certification. Students learn and apply best practices for instruction in reading, writing, speaking, and listening. Through varied contexts, students explore how to use language arts components for an array of purposes and audiences. Coursework combines a broad array of language arts courses with liberal arts and professional education courses. Teachers of English are in a unique position to help young people understand language usage, enjoy diverse literature genres, use writing as a vehicle for response and self-expression, and research to satisfy a thirst for knowledge. The Physical Science Teacher Education concentration prepares graduates to become certified to teach physics and chemistry in grades 7-12. Science educators play a vital role in cultivating an appreciation and understanding of the physical sciences in today's youth, through demonstrations, experimentation, research, and involvement in current issues that impact our lives. The coursework emphasizes a depth of scientific understanding, as well as liberal arts and professional education courses. The Life Science Teacher Education program prepares graduates for certification to teach the life sciences in grades 7-12. Science teachers must skillfully guide students' understanding of the world of science and how it relates to their health, environment, values, and a broader knowledge of the world. As with the physical science concentration, the life science course requirements help cultivate depth in scientific understanding along with liberal arts and professional education courses. A strong liberal arts experience is essential to the success of being an secondary education teacher. Liberal arts courses include experiences in English, mathematics, sciences, psychology, ethics, and microcomputing. These are the foundation of a well rounded professional secondary education teacher. 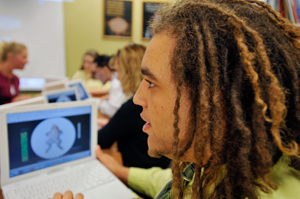 Professional educational courses prepare teachers to be conversant with the philosophy of education, educational processes, standards, and technology as defined by the State of Maine Learning Results for 21st century educators. Courses in these areas include philosophical foundations of education, tests and measurement, curriculum and evaluation, and seminar in teaching. There are a number of subject-specific courses in the program. They are designed to prepare students a solid foundation in either life sciences, physical science, or English education. Teaching skills, methods, curriculum and evaluation for junior and high school are emphasized. There is one non-credited clinical experience, three one-credit-hour practicum fieldwork experiences, and a fifteen-credit-hour student teaching experience. For more information on Clinical, Practicum, and Student Teaching experiences, please see Experiential (Hands-On) Learning or click here.